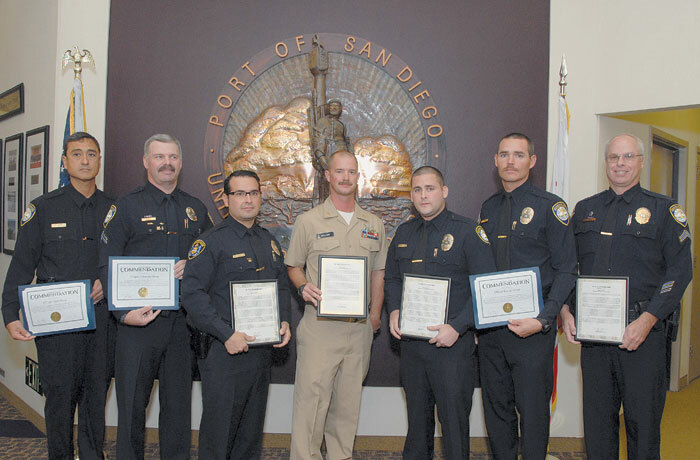 SAN DIEGO — Seven Harbor Police officers, a San Diego Police officer and a Navy Chief Petty officer were presented with lifesaving awards and commendations at the Nov. 13 Board of Port Commissioners meeting. The awards were in recognition of lifesaving actions during three separate incidents that occurred in August and September. Harbor Police Assistant Chief Mark Stainbrook presented certificates of commendation to Harbor Police officers Sam Davis, David Zacchilli, Daniel Giese and Kevin Seelicke for their actions during a fire Sept. 30 at a naval housing complex near North Harbor Drive. Lifesaving awards were also awarded to officer Andres Mendoza, Navy Chief Petty officer Joshua Erickson and San Diego Police officer Chris Harrison, for helping to save the life of a woman who was found unconscious in San Diego Bay on Sept. 16. Lifesaving awards were presented to corporals David Marshall and Joseph Sharp for saving the life of a man who fell into San Diego Bay Aug. 18. Additionally, certificates of commendation were presented to Harbor Police officers Raul Munoz and David Zacchilli for their assistance in the incident. Aug. 18: While on evening vessel patrol in the bay, corporals Marshall and Sharp responded to a radio call about a man struggling to stay afloat near Anthony’s Restaurant in the North Embarcadero area. After spotting the man, Marshall jumped into the water and performed a swim rescue. Sharp helped pull the man into the Harbor Police vessel. Marshall evaluated the man, who was suffering from hypothermia and was nearly unconscious. He attended to him while Sharp steered the vessel to the dock at Anthony’s Restaurant. There, they were met by paramedics from the San Diego Fire Department, who transported the man to the University of California, San Diego Medical Center. Sept. 16: In the early morning, Officer Mendoza responded to a call about a woman floating in San Diego Bay. She was first spotted by a fisherman, who alerted Joshua Charles Erickson, an off-duty Navy chief petty officer, who was walking in the area. Erickson jumped into the water and was able to reach the woman. He called out to Mendoza, who jumped into the bay and pulled them both to the Broadway Pier dock. Officer Harrison was at the dock and helped pull all of them out of the water. At the Broadway Pier dock, Harrison and Mendoza administered CPR on the woman. Harbor Police officers Munoz and Zacchilli arrived at the dock and took the woman aboard their Harbor Police vessel. Harrison and Mendoza continued CPR as the vessel made its way to the dock. On the way, the woman regained consciousness and was able to breathe. San Diego Fire Department paramedics met the vessel at the dock and transported the woman to the University of California, San Diego Medical Center for treatment. Sept. 30: At about 6 a.m., the officers were returning to Harbor Police headquarters on North Harbor Drive after the end of their shifts, when they saw smoke coming from the naval housing area. After realizing that flames were coming from the back of a home, they immediately alerted the residents and neighbors and were able to safely evacuate them. Using fire extinguishers and water, they kept the flames at bay until city of San Diego firefighters arrived to take over. Because of the officers’ quick action, there were no deaths or injuries, and fire damage was limited to an exterior garage and a fence.